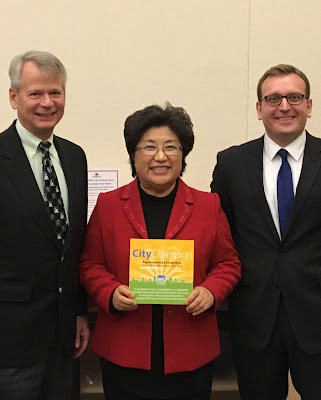 The Association of Washington Cities (AWC), an Olympia-based organization advocating on behalf of Washington’s 281 cities and towns, awarded Representative Cindy Ryu its City Champion Award. The award acknowledges the hard work and dedication of legislators and partners who championed critical city issues during the 2018 legislative session. AWC recognized Representative Ryu for her work in preserving the Public Works Trust Fund. City infrastructure systems (like water, sewer, and stormwater) are a critical part of a larger network that serves and benefits the entire state. In the past, the Legislature has diverted funds from infrastructure programs to address operating budget shortfalls. The result has been a pent-up need for infrastructure investment. State investment that supports basic local infrastructure means communities can more affordably maintain and build water, sewer, and other basic infrastructure to meet the needs of residents and the environment. The Public Works Trust Fund is an infrastructure investment program essential to cities efforts to maintain vital infrastructure in their communities and it was at risk of being eliminated. Thanks to the hard work of Representative Ryu and several other legislators, the Fund was preserved and will provide future benefits to cities and their residents. The Association of Washington Cities serves its members through advocacy, education and services. Founded in 1933, AWC is a private, nonprofit, nonpartisan corporation that represents Washington's cities and towns before the state legislature, the state executive branch, and with regulatory agencies. Membership is voluntary. However, AWC consistently maintains 100 percent participation from Washington’s 281 cities and towns.